Born in Königsberg, East Prussia, Immanuel Kant (April 22, 1724 – February 12, 1804) was a German philosopher and scientist (astrophysics, mathematics, geography, anthropology) from East Prussia. Quite generally regarded as one of history’s truly great thinkers, Immanuel Kant is known for the historical synthesis of his transcendental method. His philosophy brought together the two major currents competing at the time of the Enlightenment, the metaphysical approach and the empirical approach. Through his “Copernican revolution,” Kant moved the criterion of truth from assertions about an external reality to the immediacy of the knowing self. His contribution practically put an end to philosophical speculation as it had been practiced for centuries, it established a firm basis for factual knowledge (in particular the scientific method), but it also opened the way to agnosticism on ultimate issues. For better or for worse, his legacy has never been entirely transcended to this day. Kant has been justly recognized for creating a revolutionary synthesis between the absolute, but speculative certainties of the continental rationalism of his time (represented by Leibniz) and the practical approach of British empiricism (culminating with David Hume) that ended up in universal skepticism. It is obvious, however, that Kant’s initial position was considerably closer to the continental rationalism of Leibniz and Wolff than to British empiricism. Both his background and his personal inclination caused him to search for absolute certainties rather than pragmatic solutions. Hume’s skepticism merely served as a catalyst to make him realize how little certainty there could be in any metaphysical construct. Kant later described himself as a lover of metaphysics whose affection had not been reciprocated. Kant has also been struggling on an even more fundamental level to reconcile the conflicting influences of eighteenth century rationalism and religious aspirations influenced by the spiritual intuitions of his Pietist background. Bringing these two elements into a consistent synthesis proved more problematic. Kant harbored a lifelong dislike of religious formalism, but he also had a passion for the inquiry into ultimate reality (God, freedom, and the afterlife) based on an undeniable, though muted, personal spirituality. It has been said that his moral philosophy, including the notion of the categorical imperative, represents a sort of secularized version of Lutheranism. In spite of all its greatness, Kant’s philosophy leaves on with a feeling of incompleteness and some degree of dissatisfaction, since its conclusion is that one can’t really know. Beginning with Fichte and Schelling and culminating with Hegel, the German idealists have quickly moved to fill the gap and to identify Kant’s thing in itself, thus reintroducing speculation. As a general rule, though, modern and contemporary philosophy has expanded on Kant’s critical approach, moving from ontological to epistemological questions, gradually restricting the sphere of knowledge thought to be certain. Immanuel Kant was born, lived, and died in Königsberg, the capital of East Prussia, a city which today is Kaliningrad-in the Russian exclave of that name. His father was a German craftsman. His parents baptized him as Emanuel Kant, which he later changed to Immanuel after learning Hebrew. He spent much of his youth as a solid, albeit unspectacular, student. Contrary to the dour image of him promoted by early biographers, Kant as a young man was quite gregarious and enjoyed attending social events about town. He also regularly invited guests over for dinner, insisting that company and laughter were good for his constitution. It was only after befriending the English merchant Joseph Green, who instilled in Kant a respect for living according to strictly observed maxims of behavior, that Kant began living a very regulated life. In fact, Kant’s life became so well regulated that neighbors are said to have set their clocks when seeing him pass by on his daily walks. For the remainder of his life Kant remained unmarried and owned only one piece of art in his household, advocating the absence of passion in favor of logic. He never left Prussia and rarely stepped outside his own hometown. He was a respected and competent university professor for most of his life, although he was in his late fifties before he did anything that would bring him historical repute. He entered the local university in 1740, and studied the philosophy of Gottfried Leibniz and Christian Wolff under Martin Knutsen, a rationalist who was familiar with the developments of British philosophy and science. Knutsen introduced Kant to the new mathematics of Sir Isaac Newton and, in 1746, Kant wrote a paper on measurement, reflecting Leibniz's influence. In 1755, he became a private lecturer at the university, and while there published "Inquiry into the Distinctness of the Principles of Natural Theology and Morals," where he examined the problem of having a logical system of philosophy that connected with the world of natural philosophy, a concern typical of the period. In this paper, he proposed what later become known as the Kant-Laplace theory of planetary formation, wherein the planets formed from rotating protoplanetary discs of gas (see solar nebula). Kant was also the first recorded scholar to postulate (as is true) that some of the faint nebulae one can see with a small telescope (or in one case, with the naked eye) were external galaxies or, as he called them, island universes. In the years preceding the birth of his critical philosophy, Kant had also been confronted directly by the question of afterlife through the works of the Swedish scientist and spiritualist Emanuel Swedenborg. In his correspondence, one finds clear evidence of his fascination. When it was reported that Swedenborg had given a detailed description of a fire that had just broken out 50 miles away, Kant commented: “[This] occurrence appears to me to have the greatest weight of proof, and to place the assertion respecting Swedenborg’s extraordinary gift beyond all possibility of doubt” (qtd. in Sewall, 158). 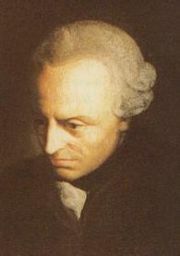 In 1766, only five years prior to the publication of his first critique, Kant still admitted in a letter to Moses Mendelssohn that “I cannot help cherishing an opinion that there is some validity in these experiences in spite of all the absurdities involved in the stories about them” (Kant’s April 8, 1766 letter to Mendelssohn; qtd. in Sewall, 162). A substance which is permanently present in space, yet without filling it… or a peculiar fundamental power of the mind of intuiting the future by anticipation (instead of merely inferring from past and present events), or, finally, a power of the mind to place itself in community of thought with other men, however distant they may be—these are conceptions the possibility of which has no ground to rest upon. (CPR, A 222-223, B 270). Nevertheless, many have noted the lingering influence of Swedenborg in Kant’s critical writings, where it appears in “neutralized” form through references to the noumenal world. In 1766, he was appointed Second Librarian of the Prussian Royal Library, a prestigious government position. In 1770, he became a full professor at Königsberg. It was after this time that Hume's works began to have serious impact on his understanding of metaphysics though there is considerable evidence he had read Hume earlier and that it was only the breakdown of an early attempt at constructing a rationalist metaphysics that led him to see Hume's contribution to philosophy as decisive. Hume was fiercely empirical, scorned all metaphysics, and systematically debunked great quantities of it. His most famous thesis is that nothing in our experience can justify the assumption that there are "causal powers" inherent in things—that, for example, when one billiard ball strikes another, the second must move. For Hume, such a conclusion was merely based on the habit of observation and, though acceptable in a practical sense, it could in no way be proved to be a law. Kant found Hume's conclusions unacceptable but recognized the devastating effect of his thought on the certainties of existing rationalism. “I willfully admit that it was David Hume that woke me from my dogmatic slumber,” he would later write. Kant would then set out to establish how the human mind could reach certainty in a way capable of withstanding the criticism of Hume—and any other criticism. For the next 10 years, he thus worked on the architecture of his own philosophy. In 1781, he released the Critique of Pure Reason, one of the most influential, widely cited, and widely disputed works in Western philosophy. He followed this with Groundwork of the Metaphysic of Morals, then in 1788, the Critique of Practical Reason and in 1790, the Critique of Judgment. The effect was immediate in the German-speaking world, with readership including Ludwig van Beethoven and Johann Wolfgang von Goethe. But the attention was far from universally approving: on the contrary, almost every aspect of his writing was attacked and criticized fiercely, particularly his ideas on categories, the place of free will and determinism, and whether we can have knowledge of external reality. The Critique of Practical Reason dealt with morality, or action, in the same way that the first Critique dealt with knowledge, and the Critique of Judgment dealt with the various uses of our mental powers that neither confer factual knowledge nor determine us to action, such as aesthetic judgment, for example of the beautiful and sublime, and teleological judgment, that is, construing things as having "purposes." As Kant understood them, aesthetic and teleological judgment connected our moral and empirical judgments to one another, unifying his system. Two shorter works, the Prolegomena to any Future Metaphysics and the Groundwork to the Metaphysics of Morals treated the same matter as the first and second critiques respectively, in a more cursory form—assuming the answer and working backward, so to speak. They serve as his introductions to the critical system. The epistemological material of the first Critique was put into application in the Metaphysical Foundations of Natural Science; the ethical dictums of the second were put into practice in Metaphysics of Morals. His work on moral philosophy is best known for its formulation of a basic tenet of ethics, which Kant called the "categorical imperative": "Act only on that maxim whereby thou canst at the same time will that it should become a universal law." Sometimes falsely assumed to be an extension of the ethic of reciprocity (Golden Rule), the categorical imperative defines deontological ethics of which Kant is the main representative. 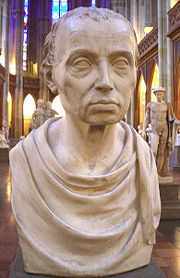 Kant also wrote a number of semi-popular essays on history, politics, and the application of philosophy to life. These include a short but influential work on Perpetual Peace (1795). When he died in 1804, he was working on an incomplete manuscript that has been published as Opus Postumum. His tomb and its pillared enclosure outside the cathedral in Königsberg is one of the few artifacts of German times preserved by the Soviets after they conquered East Prussia in 1945. A replica of a statue of Kant that stood in front of the university was donated by a German entity in 1991 and placed on the original pediment. Kant defined the Enlightenment, in the essay "Answering the Question: What is Enlightenment?," as an age shaped by the motto, "Dare to know." This involved thinking autonomously, free of the dictates of external authority. However, for Kant, “Enlightenment” never had the anti-religious flavor that was its trademark in France. Kant's work served as a bridge between the Rationalist and Empiricist traditions of the eighteenth century. He had a decisive impact on the Romantic and German Idealist philosophies of the nineteenth century, and his work has also been a starting point for many twentieth century philosophers. The two interconnected foundations of what Kant called his "critical philosophy," of the "Copernican revolution" he claimed to have wrought in philosophy, were his epistemology (or theory of knowledge) of transcendental idealism and his moral philosophy of the autonomy of reason. These placed the active, rational human subject at the center of the cognitive and moral worlds. With regard to knowledge, Kant argued that the rational order of the world as known by science could never be accounted for merely by the fortuitous accumulation of sense perceptions. It was instead the product of the rule-based activity of "synthesis." This consisted of conceptual unification and integration carried out by the mind through concepts or the "categories of the understanding" operating on perceptions within space and time, which in turn are also mental structures. Thus the objective order of nature and the causal necessity that operates within it are products of the mind in its interaction with what lies outside of mind (the "thing-in-itself"). The latter can never be known except through the forms that the mind imposes upon it. With regard to morality, Kant argued that the source of the good lies not in anything outside the human subject, either in nature or given by God, but rather only in a good will. A good will is one that acts in accordance with universal moral laws that the autonomous human being freely gives itself. These laws obligate her or him to treat other human beings as ends rather than as means to an end. These Kantian ideas have largely framed or influenced all subsequent philosophical discussion and analysis. The specifics of Kant's account generated immediate and lasting controversy. Nevertheless his theses that the mind itself makes a constitutive contribution to its knowledge (and that knowledge is therefore subject to limits which cannot be overcome), that morality is rooted in human freedom acting autonomously according to rational moral principles, and that philosophy involves self-critical activity irrevocably reshaped philosophy. Kant’s appearance in the history of modern philosophy has been compared to that of Socrates more than two thousand years ago, but it is not easy to appreciate the significance of his contribution when one first reads his extremely dry writings, especially the groundbreaking Critique of Pure Reason. Kant’s sentences are exceedingly long and their complex architecture, made of intricate sets of interrelated and subordinate propositions, reveals his inability to grasp the organic nature of the language. Sometimes, his logical constructs are so complicated that Kant himself “misses,” resulting in grammatically inconsistent sentences. However, those who take the time to investigate him seriously will come find Kant’s work curiously fascinating because of those very qualities. His seriousness in finding the unquestionable truth is perhaps unequaled. Like many other philosophers, Kant introduced a new terminology, consisting of a mixture of neologisms and expressions borrowed from tradition and given a new meaning. Due to his uniquely influential position in modern thought, much of his terminology has become part of the general philosophical language. The Critique of Pure Reason (Kritik der reinen Vernunft), first published in 1781 with a second edition in 1787, is widely regarded as the most influential and widely read work of Immanuel Kant and one of the most influential and important in the entire history of Western philosophy. It is often referred to as Kant's "first critique," and was followed by the Critique of Practical Reason and the Critique of Judgment. Kant saw the first critique as an attempt to bridge the gap between rationalism and empiricism and, in particular, to counter the radical empiricism of David Hume. Kant’s starting point is what he calls the transcendental approach, i.e., an investigation into the a priori conditions of knowledge. Regardless of any particular experience, how can we know with absolute certainty that the knowledge we gain is true? Thus, the Critique of Pure Reason is an attempt to answer two questions: "What do we know?" and "How do we know it?" For Kant, trying to find a true answer to these questions empirically, by observing the world around us, was a hopeless undertaking destined to end in skepticism, as it did with Hume. Instead, it was necessary to first investigate our mind’s ability to know and to clearly establish its limits. In short, Kant found that knowledge comes through us through two avenues: our sense perceptions in time and space, and our intellect’s cognitive forms (or categories), such as the notions of causality and existence, which give shape to these sense perceptions. Both are needed to reach knowledge. In Kant's words, "thoughts without content [are] empty, and intuitions without concepts [are] blind." Kant argues that space and time are not part of what we might regard as objective reality, but are part of our apparatus of perception, and causality is a conceptual organizing principle that we impose upon nature. In other words, space and time are a form of seeing and causality is a form of knowing. Both space and time and our conceptual principles and processes pre-structure our experience. Thus, things as they are "in themselves" are unknowable. For something to become an object of knowledge, it must be experienced, and experience is pre-structured by the activity of our own minds – both space and time as the forms of our intuition or perception, and the unifying, structuring activity of our concepts. These two aspects of our minds turn things-in-themselves into the world of our experience. We are never passive observers or knowers. Kant's I—the Transcendental Unity of Apperception—is similarly unknowable. I am aware that there is an "I," subject, or self that accompanies all of my experience and consciousness. But since I only experience it in time, which is a "subjective" form of perception, I can never know directly that "I" that is appearing in time as it might be "in itself," outside of time. Thus we can never truly know ourselves as we might be outside of or prior to the forms through which we perceive and conceive ourselves. This provided Kant with the basis to distinguish between phenomena – things as they appear to our senses (including the inner sense of time) – and noumena or things in themselves – things that are purely objects of thought independently of sense perception, which, by definition, we can never experience. In the structure of the CPR, the Transcendental Aesthetic is the section that considers the contribution of intuition to our knowledge or cognition. By aesthetics, Kant does not refer to the study of art and beauty, but to that of our sense perceptions; by intuition, he simply means the capacity of our senses to perceive, and not a mysterious sixth sense. The Transcendental Logic is that part of the CPR where Kant investigates the understanding and its role in constituting our knowledge. The understanding is defined as the faculty of the mind that deals with concepts (A51-52/B75-76). The Logic is divided into two parts: the Analytic and the Dialectic. In the Analytic Kant investigates the contributions of the understanding (Verstand) to knowledge. In the Dialectic Kant investigates the limits of reason (Vernunft). The result of the CPR is twofold: first, we are certain that knowledge can be true within the parameters of our own mind. We know that things do exist in time and space and that they follow the law of cause and effect and similar laws, but only “to the extent that they appear to us,” i.e., as phenomena. Second, we can never know what things are in themselves. Furthermore, we can never say anything meaningful about those things that do not exist within the framework of our sense perception, e.g., God and the immortality of the soul. The good news, says Kant, is that it is also utterly impossible to disprove their existence. These things are not part of our world and we can say nothing about them. The last part of the CPR contains a lengthy discussion of the ways in which the mind is led astray when it tries, as traditional metaphysics does, to prove or disprove truths about these transcendent objects. The so-called “Paralogisms” and “Antinomies” are meant to show that, when it speaks about what it can’t know, our reason ends up in insurmountable contradictions, e.g., proving at the same time that the world must have had a beginning and that it cannot have had one. The noumenon exists as the horizon of our experience of a thing, a horizon that can only be circumscribed with philosophical concepts. Kant's whole metaphysical system, which is based on the operations of cognitive faculties, was meant to describe the world as we experience it—a much more modest task than describing the world as it is beyond our experience of it, which, according to Kant, is what all previous philosophy was mistakenly trying to do. The CPR and Kant’s epistemology in general are immensely complex. Kant himself somewhat immodestly said that the central part of his deduction was the most difficult task ever undertaken in philosophy. Two central points of contention stand out. First, Kant did believe that there was a reality. He strongly disapproved of Berkeley’s subjective idealism, for which reality only exists through the perception of the mind. In the second edition of the CPR, Kant added an entire section destined to show that the world exists. His critique is merely saying is that we cannot know what it outside of our perception, but that it does exist is not in doubt. To what extent Kant can justify this position from his premises is questionable. Second, the notion of the Ding an sich, the unknowable thing in itself, is very problematic. Considerable difficulties arise each time Kant attempts to say something about it after affirming that nothing can be meaningfully said. This is the case when Kant hints to the fact that things in themselves are somehow the ground of the phenomenal world. Since the two realms are supposed to be separated by an unbridgeable abyss, such a suggestion is not really supportable, except by appealing to a sort of intuition that Kant himself rejects. Jacobi was the first to highlight this problem. Nevertheless, the noumenon or thing in itself is a fertile notion, in that it implies that reality is more than merely what it appears to be. The CPR had ended with the conclusion that definite rational knowledge about God, freedom and the soul was not available to us, because we lacked “intellectual intuition,” i.e., the capacity to directly know such things that are not part of the world of senses. At the same time, Kant concluded, our reason can’t help being concerned with these issues. We inevitably end up trying to solve the ago-old metaphysical questions about ultimate things. We can’t help it, because they alone can give meaning to our lives. In the end, then, we have to act “as if” these questions were settled, because our moral sense tells us that the ideas of God, freedom and the immortality of the soul must correspond to reality. This leads us to the consideration of ethical questions. Kant is known for his theory that there is a single moral obligation, which he called the Categorical Imperative, from which all other moral obligations are generated. The categorical imperative is very much connected to the notion of duty, which Kant addresses rather empathically as the "sublime and mighty name." His perspective, however, is that the imperative of duty is a call from our conscience, not a duty imposed from outside. In that sense, Kant stresses the autonomy of the human mind in moral matters, just as he does in cognition. He believed that the moral law is a principle of reason itself, and is not based on contingent facts about the world (e.g., what would make us happy). Accordingly, he believed that moral obligation applies to all and only rational agents. The first formulation (Formula of Universal Law) says: "Act as if the maxim of thy action were to become by thy will a universal law of nature." The second formulation (Formula of Humanity) says: "Act that you use humanity, whether in your own person or in the person of any other, always at the same time as an end, never merely as a means." The third formulation (Formula of Autonomy) is a synthesis of the first two. It says that we should so act that we may think of ourselves as legislating universal laws through our maxims. We may think of ourselves as such autonomous legislators only insofar as we follow our own laws. In his works, Kant discusses the practical implications of the categorical imperative and the dilemmas to which it leads, and he tries to give consistent guidelines. Still, the general lack of emphasis on content and results in his ethics, coupled with the absoluteness of the sense of moral obligation, has led some to conclude that Kant’s views may have unintentionally led to certain unfortunate actions performed later in history in the name of duty. Kant’s categorical imperative to do “what is right” is manifestly related to biblical statements such as “do unto others…” In Kant’s words, it is more important to be worthy of happiness, than to seek to be happy. It is undeniable that Kant’s moral theory is very much a systematic, secularized form of Christian ethics. However, Kant insists that it is reason alone that leads us to make justified assumptions about these matters in spite of our theoretical uncertainty. Kant had an aversion for conventional religiosity and the dictates of established churches. It is primarily in that sense that his insistence on “reason alone” should be understood, i.e., reason, and not any doctrinal teaching. On the other hand, he also stated that by eliminating the false certainties of reason about transcendent things (God), he made place for faith. The notion of a purely rational faith has often been criticized, even by Kant’s admirers. In fact, religion for Kant is quite exactly identical with ethics; it does not possess its own independent sphere. One could well say that in Kant the religious element was present, but “frozen” by the constraints of his Enlightenment views. Throughout his work, Kant makes considerable effort to salvage the notions of God, eternal life, and especially freedom, that were essential to him, and to give them equal status to the certainties of theoretical reason. He ended up with two parallel dimensions, e.g., the notion that our actions are predetermined in the realm of natural causes, while at the same time and without contradiction, they are free on the unknowable level of the noumenon. Two things fill the mind with ever new and increasing admiration and awe, the more often and perseveringly my thinking engages itself with them: the starry heavens above me and the moral law within me. In spite of his predominantly theoretical preoccupations, Kant has been deeply concerned throughout his life with the issues of freedom and the new political order brought about by the French Revolution. He was fascinated by Rousseau’s idea of a “social contract” and was deeply opposed to the arbitrary character of despotic power. In 1795, the already aging Kant published a short “philosophical sketch on Perpetual Peace” in which he outlines the essential preconditions to the creation of lasting peace, as opposed to peace understood as a temporary cessation of hostilities. His proposal was received with skepticism and considered too remote from the realities of world affairs at the time. For this very reason, in the twentieth century, Kant’s proposal received new attention and it is now considered to be a remote antecedent to the League of Nations and the United Nations. In his brief essay, whose title reflects that of an earlier treatise by the Abbé de Saint-Pierre, Kant carefully lists the conditions needed for peace to be more than an armistice between feuding powers ready to fight again as soon the opportunity arises. Essentially, Kant’s list excludes the practice of power politics as it was applied by the rulers up until his time. It also includes prophetic insights that have materialized in the Geneva Convention and the notion of human rights as it is understood today: even when at war, nations should keep minimal rules of decency so as not to jeopardize the future possibility of peace, world citizenship should allow all human beings to be welcome in every country, and more generally right should have primacy over power. Kant's most powerful and revolutionary effect on philosophy, which changed forever its meaning, modes of thinking, and language(s), was not "positive" in the sense of producing specific assertions about the world that have become accepted truths, as in the positive sciences. Rather it was "negative" in the sense of restricting the areas about which such knowledge was possible—by making philosophy "critical" and self-critical. Kant's idea of "critique" was to examine the legitimate scope of the mind or of knowledge. In this regard the Critique of Pure Reason meant examining what certain and legitimate knowledge human beings could arrive at simply by thinking about things independently of experience and perception, with his conclusion being: not very much. Prior to Kant, the entire mode of functioning of most philosophy was drawing conclusions about the nature of the universe, of God, or of the soul simply by logical thinking about them, by what seemed to make sense through "a priori" thinking, i.e. thinking on purely logical grounds. For this sort of thinking it must be the case that God or the universe is this way or that way, because it makes sense logically. But, in the history of philosophy, for every philosophical theory that God or the universe or the mind must be one way, some philosopher arrived at another theory stating that it must be precisely the opposite way. Kant called this unproductive, irresolvable, back-and-forth, dogmatic thinking the "dialectic of pure reason." That is, it was an inevitable consequence of trying to arrive at knowledge on purely logical grounds independently of experience or of scientific knowledge based on the evidence of the senses. For Kant, this entire style of pursuing knowledge was bankrupt and had to be abandoned. Some important philosophers and schools of thought, such as German Idealists, neo-Thomists and other theologically oriented philosophers, and Heidegger's "fundamental ontology" have refused to accept the limitations that Kant imposed upon philosophy and attempted to come up with new metaphysical systems about "the Absolute," "God," or "Being,” although even these philosophers have generally tried doing so by taking Kant into account. Overall, however, post-Kantian philosophy has never been able to return to the style of thinking, arguing, and asserting conclusions that characterized philosophy before him. In this way, Kant was correct in asserting that he had brought about a "Copernican revolution" in philosophy. According to Kant, Copernicus's revolution in the understanding of the cosmos lay in taking the position of the observer into account. This explained why it looks as though the sun revolves around the earth even though in reality the earth revolves around the sun. Kant saw this revolution, in turn, as being part of "Enlightenment" (as conceived of in the Age of Enlightenment) and the creation of an enlightened citizenry and society freed from dogmatism and irrational authority. Kant's wider influence not only in philosophy but in the humanities and social sciences generally lies in the central concept of the Critique of Pure Reason, namely that it is the synthesizing, unifying, constitutive activity of the subject of knowledge that is at the basis of our having an ordered world of experience and of the objects of knowledge themselves. This idea has spread out through many intellectual disciplines in which it has manifested itself in different forms, for example from Karl Marx's notion, in social theory, of the constitutive role of human labor in the creation of history and society through Freud's notion, in psychology, that the activity of the ego produces the reality principle through Emile Durkheim's notion, in sociology, that society creates collective consciousness through social categories through Chomsky's notion, in linguistics, of transformational grammar, to current notions, in several of the humanities and social sciences, of the "social construction of reality." In this way Kant's conception of synthesizing, ordering mental activity has become central to modern intellectual culture. All links retrieved May 10, 2014. Anthropology from a Pragmatic Point of View (1798), trans. M. J. Gregor (The Hague: Martinus Nijhoff, 1974). Critique of Judgment (1790), trans. W. S. Pluhar (Indianapolis: Hackett Publishing Company, 1987). Critique of Practical Reason (1788), trans. L. W. Beck (New York: Macmillan Publishing Company, 3rd ed. 1993). Critique of Pure Reason (1781; rev. ed. 1787), trans. N. K. Smith (London: MacMillan & Co., 1963). Foundations of the Metaphysics of Morals (1785), trans. L. W. Beck (New York: Macmillan Publishing Company, 2nd rev. ed. 1990). Metaphysical Foundations of Natural Science (1786), trans. J. W. Ellington, Philosophy of Material Nature (Indianapolis: Hackett Publishing Company, 1985). On the Form and Principles of the Sensible and the Intelligible World (1770), trans. D. Walford in collaboration with R. Meerbote, Theoretical Philosophy, 1755–1770 (Cambridge: Cambridge University Press, 1992). Religion within the Limits of Reason Alone (1793), trans. T. M. Greene and H. H. Hudson (New York: Harper & Row, 1960). The Metaphysics of Morals (1797), trans. M. J. Gregor (Cambridge: Cambridge University Press, 1991). What is Enlightenment? (1784), trans. L. W. Beck. In Foundations of the Metaphysics of Morals (New York: MacMillan Publishing Company, 2nd rev. ed. 1990). Any suggestion of further reading on Kant has to take cognizance of the fact that his work has dominated philosophy like no other figure after him. Nevertheless, several guideposts can be made out. In Germany, the most important contemporary interpreter of Kant and the movement of German Idealism which he began is Dieter Henrich, who has some work available in English. P.F. Strawson's "The Bounds of Sense" (1969) largely determined the contemporary reception of Kant in England and America, but his positions have been challenged by a number of recent thinkers including Henry Allison, Paul Guyer, Robert Pippin, Terry Pinkard, and Béatrice Longuenesse. This body of work has begun to lessen the divide between academic interpretations of Kant in the English speaking world and in Europe. John Rawls' Lectures on the History of Moral Philosophy, is particularly useful in its investigation of Kant's moral philosophy within the vicissitudes of ethical systems from Hume to Leibniz to Hegel. More recently, Gary Banham has published a key interpretation of Kant's practical philosophy that has corrected exclusive focus on the categorical imperative in favour of an inclusive comprehension of right and virtue. John McDowell is perhaps the most important contemporary analytic philosopher who explicitly builds upon Kantian themes. Howard Caygill's dictionary of Kantian terms is an excellent guide to the overall terrain of the influence and nature of Kant's concepts. Proceedings of the International Kant Congresses. Several Congresses (numbered) edited by various publishers are also available. This page was last modified on 26 February 2018, at 00:32.